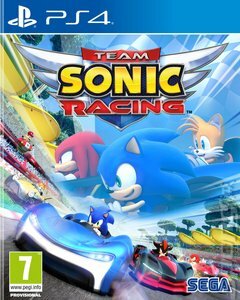 - Online Multiplayer &amp; Local Co-Op Modes - 12 players per race, 4 player split screen, and various offline / online race modes including Grand Prix Mode, Exhibition Mode, Time-Trial and Team Adventure Mode. - Team Racing - Race as a team, win as a team. Use various team moves to assist your teammates, knock out opponents and unleash your Team Ultimate. - Performance &amp; Skin Customisation - Alter the appearance and handling of your vehicle. - Wisps - 14 spectacular offensive and defensive items to help overcome rival teams and get ahead! - Adventure Mode - Unique story experience where players are introduced to basic game features and characters. - Various Characters and Types - 15 playable characters from across the Sonic Universe and 3 distinct character types including Speed, Technique, and Power.